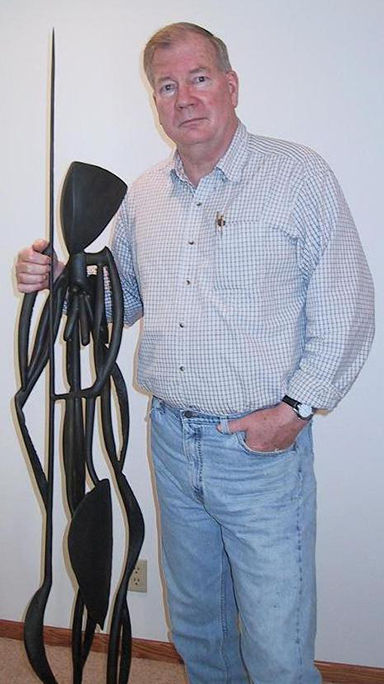 Born and raised in Chicago, Illinois, sculptor William Christoffersen currently lives in Menomonie, Wisconsin. Working primarily in forged/welded steel, the artist's current pieces represent abstract organic forms based on patterns and structures inspired by nature. Previous works have explored other sculptural mediums including stone, wood, and fabric. William Christoffersen attended the American Academy of Art in Chicago in 1957 and was later represented by several important galleries in Chicago. Works were also shown in numerous juried exhibits and in the gallery of the Art Institute of Chicago. Following military service, his artistic endeavors were set aside and William took a position as editor of a trade magazine devoted to the apparel industry. Upon his retirement and subsequent move to Wisconsin, he resumed sculpting. His recent works have won several awards.